S-TECH ENGINEERS is the Indiaâ��s major Manufacturer and Supplier of the high performing Chemical Earthing System, Chemical Gel Earthing System, and Chemical Earthing Electrodes. Our Chemical Earthing Electrodes System is manufactured using top grade raw material, procured from the prominent vendors in the market. Our Chemical Earthing Electrodes System includes Earth Pit Conductive Electrodes Soil Enhancing Compound, which in turn provides good earthing. Chemical Earthing System is the best alternative of conventional ground rods as it requires lesser space and with few electrodes it can impart excellent resistance. Further, these systems help in creating a better electrical connection with earth, along with a large conductive surface. 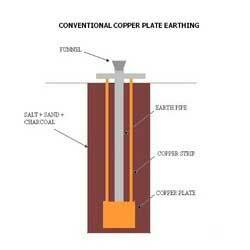 All these properties and advantages have made us a reliable Electrical Earthing System Supplier in India.